REQUIREMENTS: 100ml Shea butter, 100ml Sweet almond oil, Fine salt, Lemon grass fragrance, Dried lemon grass herb, 5 Jars, Scrub stickers METHOD: Gently melt the shea butter in the microwave for 1 minute. Pour the melted shea butter into a glass bowl and add 100ml sweet almond oil, lemon grass fragrance and a handful of dried lemon grass herb. Then add your fine salt, stirring and mixing the scrub thoroughly until you get a thickish paste. The paste must not be dry or too runny. Divide the scrub into your jars and label. USING: Put a scoop full of scrub into the palm of your hand. With a washing motion rub the scrub all over your body, hands and feet. Massage the scrub into the skin till it tingles. Then wash off the scrub with warm water and pat dry with a soft towel. The rich oils nourish and feed your skin while the salt cleanses, exfoliates and relaxes the muscles. 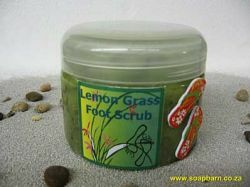 After using this scrub you feel renewed and revitalised and your skin feels like it has just been born!